This game looked good on paper and the way it played out was no disappointment. In fine sunny conditions with the slight but chilly Southerly breeze favouring the Brunswick end at Ransford Oval the Great British Bulldogs had first use. However early days and Nauru Chiefs were looking sharper – getting the centre clearances and most the early stages was played in their half. The first goal of the game was delivered by (#10) Pilo Dagiaro. Repeated attacking though saw only a couple more behinds added. And as the momentum started to shift midway through the quarter the sense that Nauru had missed a real chance to get a big jump against the breeze. 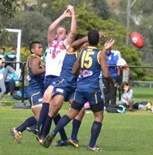 To this stage the Bulldogs were keeping key Nauru forward Oppenheimer (#2) in check. The Bulldogs were warming to the task and Matias (#1) in particular started to get his hands on the ball, while Trigg(#5) enjoying a clear height advantage but still having to contend with the footy smarts of Yoshi Harris (#20). Most of the 2nd half of the quarter was played in the Bulldogs end and with (#2) Sam Willat looking very threatening the Bulldogs had to be disappointed to only finish the term with 3 behinds on the board. Both backlines on top and a lot of defensive rebound. The main controversy seeing (#5) Adam Otto red carded out and Nauru therefore one down for the rest of the game. The second term finally saw the Bulldogs, via Willat, get that elusive first goal on the board and a narrow 1 pt lead. A safe mark and long goal against the breeze. After this Nauru again took control around the ground and were proving elusive however still tending to kick around the ground rather than generate real run and overlap. Perhaps this alone helped the Bulldogs defensive apply pressure as they were able to congest the Nauru forward 50 and while Nauru dominated this phase the result of an additional unanswered 4 behinds was slim reward. Oppenheimer managed to get hands on the ball and snapped one near to goal only to be rushed through. 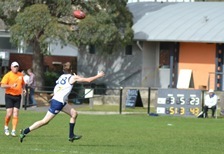 (#27) Tipung snapped from close in but missed left while (#22) Mikey had a shot from the boundary that again went left. The Bulldogs were feeling the pressure, and lucky not to concede after the fullback went over the line. However, Ballard (#26) rucking in defensive punched the ball directly over the line and concede a free to Harris. Again though – the kick went left. Shortly after Oppenheimer got clear and marked on the lead – only to slam the ball into the man on the mark. The last score for the half was to the Bulldogs who managed finally to rebound all the way but with Willat fighting 1 against 3 they were lucky to scramble a rushed behind. Heading into the main break just 2 points off the pace. Once again the third quarter saw the Chiefs coming out hard early. Brilliant midfield play by (#15) Depaune delivered the ball forward where Oppenheimer again got hands on the ball but his snap went right. Shortly after (#12) Moses marked and the long shot was just off but the Chiefs were looking ominous. 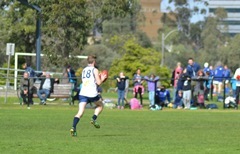 Eventually the flood gates would open – a bit at least – although perhaps the Bulldogs unlucky not to get a free in the marking dual but the ball game out the back and (#16) German was able to run in and goal. Another behind and then (#27) Kamtaura managed to get his toe to the loose ball in the goal square and the Chiefs were out to a match high 17 pt lead. 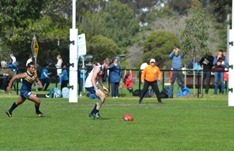 Over the next few minutes the momentum again began to swing and a fine transition via a Trigg mark on the wing, pass to (#24) Saunders who then found (#8) Harmeston marking inside 50 and able to run on and kick the crucial goal. However the Brits had now lost key forward Sam Willat with a foot injury and it was beginning to show that too many forward thrusts ended up in the arms of the Chiefs defenders and too often an uncontested turn over. Suddenly Harris (#20) for Nauru had a mark and would be kicking from the arc – however some poor discipline off the ball saw a reversal and free to the Brits. Again going forward via Matias to (#15) Mitchell and on to (#10) Judson but failing to punish the Chiefs. Just before ¾ time and Mitchell again in the thick of it getting a kick forward only to be given a front on shove after he kicked. 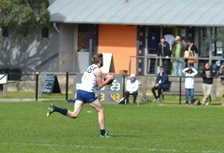 The downfield free being taken by the tireless (#14) McGeever who converted and it would be 4 pts the margin at ¾ time. All set for a grandstand finish – alas within the first minute of the last term and German (#16) sent the Chiefs forward and a find contested mark and goal to key man Oppenheimer brought the Nauru bench and cheersquad to full voice. Again some mistakes by the Bulldogs failed to go fully punished by the Chiefs as Oppenheimer's check-side snap just failed to come back on the breeze while (#23) Mwaredaga missed to the right on the run. 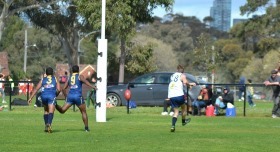 was rushed through and then a cheeky left foot banana from the boundary in the left forward pocket went wide. Last roll of the dice time and the Bulldogs found (#18) Maguire on his own through CHF. and then slotted through a neat dribbling snap along the ground. Alas Nauru now had the answers and after a high tackle was awarded to (#17) Agege in the left forward pocket he managed to draw a 25m penalty for a Bulldog too close – suddenly tempers flared and there was a bit of push and shove – as Agege lined up from the top of the square and put through the sealer. Another behind and a handy 24 point win. Nauru perhaps a little wasteful, however the Bulldogs sorely missed Willat up forward with their structures breaking down and too much of the hard work up field being wasted.